Mei-mei has made it to 22 weeks now. Today's ultrasound was OK, but we didn't get any pictures because the clinic's printer is broken. The blood flow through the cord looks good, but the doctor (one I haven't seen before) said the coiling is at "the upper end of normal". Well, it sure doesn't take much to send me into panic mode. To me, "upper end of normal" sounds like a very tiny step away from "your baby is going to die". Up to now the other doctors had all just used the word "normal", some very enthusiastically. What a difference a few words can make! Now my stress level is up a bit higher. Just in time for vacation, too! No, I will not be going on any of those slides! 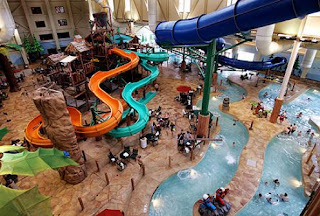 Tomorrow our little family is going on a quick overnight trip to a water park in exotic Wisconsin Dells to meet up with my sister and baby niece. I shall endeavor to have fun and "just relax", even though relaxation is as unattainable during a high-risk pregnancy as it is when battling infertility. There's just no such thing as a vacation when you're worried for your child's life, but someday I hope to go on a real vacation again. All this death and infertility and high-risk pregnancy stress has taken a huge toll. I really need a vacation from my problems, but there's still a long way to go before I get there. Baby steps. Glad the scan went OK and I'm sure those extra few words don't mean anything bad.. enjoy your break! I interpret "the UPPER end of normal" as GREAT! to me the "lower" end of normal would be bad. Upper is positive!! Does the 'upper end' mean more normal or less? I think those were a poor choice of words, esp when used with a woman who has a high risk pregnancy. Doctors need to be less obscure. You'll be alright. I know you can't see it now (just like I couldn't), but it will. You do need a break! Man, I don't know how you do it, lady. I hope you get that break in precisely 15 weeks or longer. Cuz I know it won't come sooner - and we want Mei-Mei fully baked! I understand how once you've lost your child, statistics and "normal" and risk assessments are weighted differently. I'm so glad I found you, I need a role model for hope and for inner-strength. Thank you for having the courage that I need...at least I know it's possible.